Recently, when metal bands take their music in a new direction, they usually go the heavy route. In other words, they throw meaner riffs, faster drumming, more powerful vocals, and anything else you’d consider "heavier" into their new songs. This trend towards intensity happens so often that it’s a shock when metal bands opt for the opposite way. Although in Autumn’s case, this choice isn’t a surprise. Their 2009 album, Altitude, introduced us to the band’s new singer Marjan Welman – whose voice is more melodic than that of previous frontwoman Nienke de Jong – and to a more progressive, atmospheric sound threaded into Autumn’s distinct rock/metal fusion. 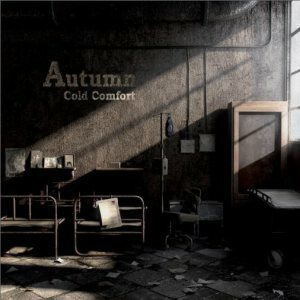 Now, Autumn reveals the latest step in its evolution: Cold Comfort, a mellow yet mature record that proves the music doesn’t need to be heavy for it to be good. In some ways, Cold Comfort is the first Autumn album that’s reminiscent of the band’s namesake season. Listeners will find themselves immersed in grungey, heavy rock that unfolds through meandering song structures and slow tempos. This record also has a vintage vibe (courtesy of producers Erik-Jan Dodd and Cees Thomassen) and a balanced mix that allows layers and nuances to poke through the main wall of music. Keyboardist Jan Munnik has a more prevalent role this time; he performs everything from notable solos to little slivers of synths that act like rays of light peaking through the shadows. Even with the change for the "softer," however, Autumn’s music hasn’t changed much. The versatile guitarwork of brothers Mats and Jens van der Valk is still present. So is the poetic, thought-provoking lyrical style from the past two albums, though the lyrical themes on Cold Comfort are noticeably bleaker. And, Welman’s warm vocals remain the centerpiece of each song. She may not be a powerhouse singer, but her articulation and her ability to create such smooth, entrancing melodies make her one of the most admirable female vocalists in the current metal scene. Actually, "smooth" and "entrancing" are two of the best words to describe Cold Comfort. The blend of gentle and brooding begins with the trippy-stoner first single, "The Scarecrow," and continues right through to the end. Despite the album’s uniformity, no two songs sound alike. Welman explores her vocal spectrum on the title track, lighting the verses with her high notes and then plunging into the depths of her melancholy. The van der Valks, on the other hand, lead "End of Sorrow" down the emotive trail with earnest guitar hooks and quieter passages. "The Venamoured" brings the album to a haunting close with sludgy arrangements and a dark, pervasive atmosphere that builds like storm clouds. Its ending reaches its ghostly crescendo slowly enough to give you waves of goosebumps that you’ll want to experience again and again. Fans can still hear traces of the old Autumn on the few uptempo tracks on Cold Comfort. "Naeon" and "Black Stars in a Blue Sky" exude the futuristic ambiances we first heard on Autumn’s 2007 album, My New Time. The former track allows synth-veils and Welman’s calm melodies to glide over nimble bass and guitar lines; the latter begins with a foot-tapping beat and rhythmic chords before lifting off with Welman’s rousing chorus. "Retrospect" is a groove-based track that’s full of contrasts. Funky guitars and cascading keys intertwine so that both instruments have their time to shine – a balance that’s common throughout the entire album. The greatest strength of Cold Comfort is that it grows on the listener over time. Autumn has clearly devoted a great deal of time shaping the moods and textures of each song on this album. Thus, each experience with Cold Comfort is a different one. The listener will discover new details every time they hit "play," all the while feeling the music’s emotional pull. Unfortunately, the fact that Cold Comfort is a "grower" is also its biggest weakness. Fans expecting a barnburner of an album – or at least a return to the My New Time era – may get bored of the record well before it ends. Part of this is because Cold Comfort lacks the energy and urgency of Autumn’s older albums. The overall collection of songs is also less memorable this time. Sure, you’ll find some new classic Autumn tracks, but nothing that can be considered an instant classic. That said, Cold Comfort shows Autumn taking a striking turn in their musical evolution. By choosing atmosphere over intensity and thus demanding more patience from the listener, this sextet from the Netherlands has crafted its richest and most intelligent album to date. Welman’s growth since Altitude is also apparent. Hearing her thrive as strongly as she does on the new record will lift your spirit. Considering the grimness of the lyrics (and, at times, the music) on Cold Comfort, that’s a rare achievement. I’m sure that metalheads will remember Autumn more for My New Time and Altitude, both of which are more exciting than this new CD. Yet, Cold Comfort is too inspiring – and too good – to be ignored for long. Best Songs: "The Venamoured," "End of Sorrow," "Cold Comfort," "Black Stars in a Blue Sky"
Cold Comfort is available for purchase at Metal Blade Records, Amazon, iTunes, and other digital and physical music retailers worldwide.